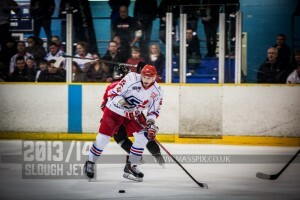 Slough Jets rested Andrius Kaminskas and gave a debut between the pipes to Joe Myers as they lined up against the Peterborough Phantoms. Ales Padelek gave Slough the lead after 5.42 when he completed from Jamie Line and Alan Lack and Kamil Tvrdek was on hand to finish from Ryan Webb at 9.11 for 2-0. Myers in net dealt well with all 9 shots he faced the first period closed out 2-0. 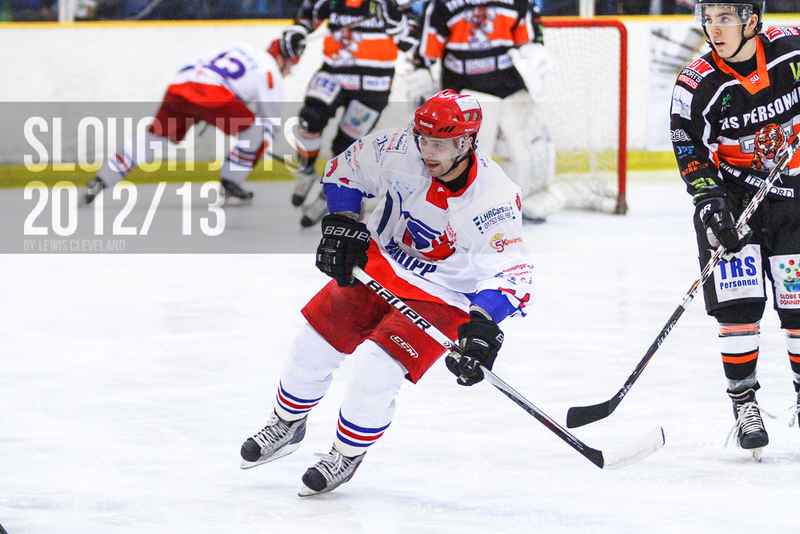 The middle period saw Slough do the damage with three further unanswered goals. Sam Waller sent in number 3 at 26.29 and when Padelek netted for the second time at 29.21 Slava Koulikov called the Peterborough time out. Alan Lack made it 5-0 at 30.55 and the period closed at the same scoreline. Period 3 saw the visitors battle back into the game with goals from Danny Wood at 47.55 and Darius Pliskauskas at 57.07 but with Slough time out called Peterborough took the opportunity to discuss their empty net tactic. With King on the bench and an open target at the other end Tvrdek took his time to finish the game off with an empty net goal at 59.21. Slough Jets hosted Telford Tigers at the Hangar for the final time this regular season welcoming back Aaron Connolly to the line-up but missing Alex Barker. Frantisek Bakrlik put the home team ahead just 144 seconds into the game when he beat Declan Ryan and the same player figured in the next goal, 12.25 later when Aaron Connolly converted a powerplay with assists from Bakrlik and Ciaran Long and the period ended with Slough holding a 2 goal lead. Darius Pliskauskas was on hand at 25.40 to finish from Dan Davies and Slava Koulikov to make it 3-0 but if Slough thought the game was won Telford had other ideas. Tim Burrows converted a powerplay while Mindy Kieras sat out to make it 3-1 at 28.55 after just 23 seconds of the powerplay had elapsed. Jaroslav Kruzik converted the next man advantage for the visitors at 35.38, 16 seconds into the powerplay to make it 3-2 and Burrows’ second, scored at even strength with 22 seconds left in the middle period, tied the game up heading into the second interval. Both teams came out fired up for the third period but 4.10 in Juraj Senko scored the third powerplay goal for the visitors to put them ahead. Slough dominated the period but failed to beat Declan Ryan again. After trading time outs Slough opted for the empty net but despite a double powerplay chance Telford’s remaining skaters and their netminder stood tall to close out for the win. Slough Jets hosted a table top clash against the Guildford Flames as the top two teams in the league battled against each other. Slough just got on the board first with a goal at 3.32 from Doug Sheppard and despite the visitors managing 15 shots against Slough’s 11 the period ended 1-0 in favour of the home team. Back out for the 2nd it took just 12 seconds for Slough to net their second when Adam Calder scored but 37 seconds later Guildford scored their first when Rick Plant netted at 20.49. Branislav Kvetan scored the equalising goal with a powerplay marker at 30.36 and Jozef Kohut put the visitors ahead at 31.31. Darius Pliskauskas netted at 32.43 to level the game but Nathan Rempel made it 3-4 at 34.47. Aaron Connolly scored Slough’s fourth at 38.11. The period ended with Guildford believing they had taken the lead but the period had already ended before the puck entered the net. The third period saw Slough dominate the shots but despite powerplay chances for both teams the period ended scoreless and the teams headed to overtime to decide the result. Overtime lasted 1.49 and only 1 shot each before the result was decided in favour of the visitors with Kohut’s second goal of the night. Local rivals Slough Jets and Bracknell Bees met at the Hangar for the second time in 10 days with this clash being just for league points. Slough dominated the offensive opening period bombarding Carl Ambler with 19 shots but it was special teams that really dominated the period with Slough scoring their first goal on the powerplay at 10.50 from Dan Davies and Adam Calder making it 2-0 at 14.15 with another powerplay goal. With Ryan Watt continuing to serve a penalty Bracknell started the third period on the powerplay and took advantage with Craig Tribe scoring at 41.27. 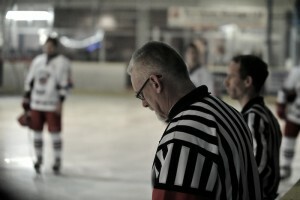 At 5-3 the game remained alive and with 1.28 remaining Bracknell called their time-out. Following the time-out Ambler was pulled from the net and then re-inserted but on the second empty net situation Calder buried the puck while Slough were shorthanded to seal victory. Sunday for Slough Jets saw them travel up to Ice Sheffield to face the Sheffield Scimitars keen to complete another four point weekend. The teams started by exchanging powerplays when Slough gave away and two man advantage and Sheffield followed with a 1 man penalty kill but it was back at even strength when Peter Jasik opened the scoring for the visitors at 7.47. Little could separate the teams but it was Jasik’s goal that was the difference at the end of the first period. Slough were penalty killing again early in the second and despite 23 shots on goal in the period the only other entry to the scoresheet was Sheffield’s penalty with 12 seconds remaining. The third period saw 23 more shots on goal and despite Sheffield conceding another penalty the game looked to be progressing to overtime after Matt Haywood equalised at 53.21 when Ryan Watt stepped up with the game winner at 58.59. Sheffield called a time-out with just 5 seconds remaining and played the remainder of the game with the empty net but Slough had secured the victory.